Vital to Equest Center for Therapeutic Riding's programs is an army of dedicated volunteers who assist in virtually every area of the center. As one of our volunteers so aptly stated “I came to Equest because of the horses — and I stayed because of the riders!” Much understanding is gained through the interaction between our special needs riders, volunteers, staff, parents and equine therapists. Many volunteers, experience their first interaction with disabled individuals at Equest. It doesn’t take long to eliminate stereo-typical ideas and misconceptions regarding these special people! A greater understanding and respect is gained for these individuals- their courage, determination and all they encounter on a daily basis. It allows everyone involved to gain a new perspective which carries over into all areas of life. 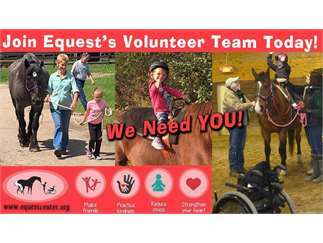 We invite individuals - both young and old- to consider becoming part of the volunteer team at Equest! Regularly scheduled classes run Monday through Friday each week, both during the day and in the evening. No horse experience is needed! For those who choose to work with the horses and clients – we will train you! There are other volunteer needs that do not involve working with the horses. Additional classes and special events run on weekends. 8. And the list goes on and on…. 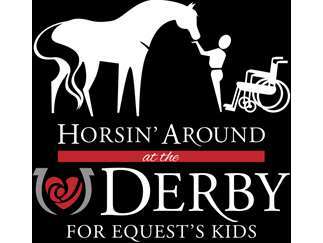 If you are interested in learning more about how to get involved please contact our Volunteer Coordinator, EmileeWujkowski at Emileewujkowski@equestcenter.org or call her at the center 616-866-3066 Ext 102. 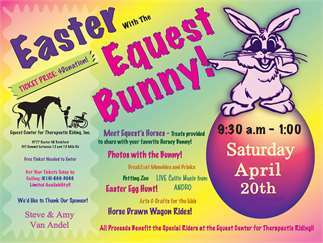 You can also locate more information online at www.equestcenter.org or Find us on Facebook!